For an introduction to the many pleasures of Brick Lane, you can’t be in safer hands than Dina Begum’s, the author of our next book – Brick Lane Cookbook. ‘When I think about Brick Lane I think about food. I go into one of those daydreams only a seasoned glutton can imagine, scanning mental images of food I want to try; that amazing sounding ice cream, freshly fried zilafi from Alauddin, a new burger, or even just… doughnuts. The uniqueness of Brick Lane lies in the fact that the restaurants and eateries that line the street are just as important as the Sunday market. Every stretch and every corner of this famous London market, affectionately known as ‘Banglatown’ due to its large Bangladeshi population, offers up a delicious new flavour. Food takes centre stage: on a plate, wrapped up in paper, slipped inside a paper bag, or enclosed within a box – less Styrofoam, more style. For uninitiated visitors to Brick Lane, the obvious choices include bagels and curries but Brick Lane these days is much more than that. You’ll be blown away by the melting pot of cultures and culinary traditions, where the past and present fuse together effortlessly and lead you to familiar and unfamiliar tastes. The curry shops of Banglatown are interspersed with cafes selling all sorts of other wonderful foods, and the market stalls that pop up in every available space each Sunday serve up specialities from everywhere from Ethiopia to Argentina. Over 200 food stalls take over Sunday Upmarket for a global feast and permanent food trucks take care of you on non-market days. I’ll often visit to try a new dish and end up on a mini culinary tour, satisfying my craving while gazing at the striking street art and browsing the vintage clothes stores. I started researching the Brick Lane Cookbook with a definite first point of call – lunch at Sweet ‘n’ Spicy – only to discover its demise. When I used to visit the market with my dad as a child, this Pakistani café used to be our regular lunch spot. You’d walk in and be greeted not only by the friendly staff but also by the mouth-watering fragrance of meat being cooked in the tandoor ovens and the headiness of smoke and spice, enveloping you in the most comforting hug. In remembrance I’ve included a recipe in the book for lamb koftas which deliver a taste of the much loved kebabs I used to enjoy; succulent grilled skewers of meat, folded inside a warm, fluffy naan and drizzled in mint sauce. Half of the recipes in my book are Bangladeshi or inspired by Bangladeshi flavours, and the other half are contributed by traders and restaurants whose food I love. Some of my favourite contributions include the delectable pistachio crème brûlée from Chez Elles, Moussaka from Damascu Bite and empanadas from Moo Cantina. 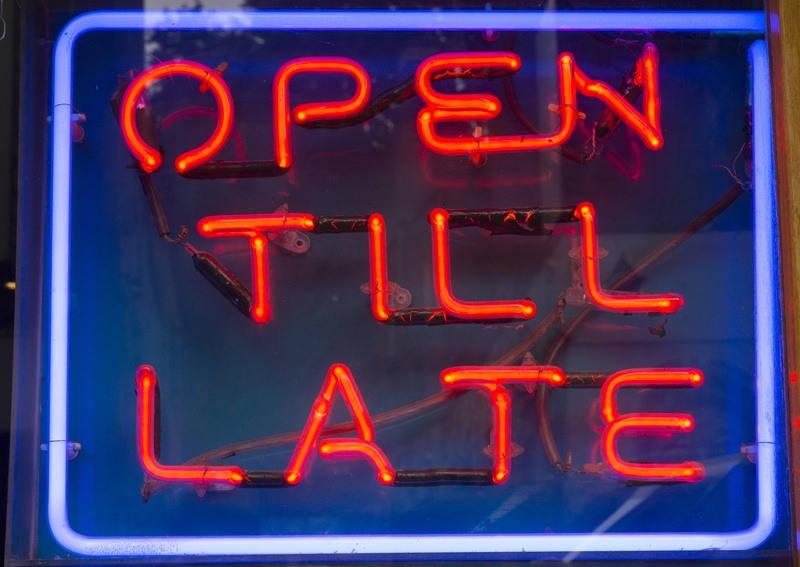 I love the street food too – like Big Bushi’s Sushi Burrito and The Patate’s incredible Beef Bourginon Burger – and had fun making the truffles from Dark Sugars – the place for good quality chocolate in East London. The traders and restaurant owners I got to know are some of the friendliest and generous people. Along with giving me tasters of their food and welcoming me into their kitchens they’ve shared closely guarded recipes that I’m proud to include in my book. This recipe is based on my mother’s and is super addictive. Ground lentils are mixed with onions, green chillies, spices and fresh coriander to make a batter, which is dropped very quickly by hand into hot oil to make these irresistible fritters. 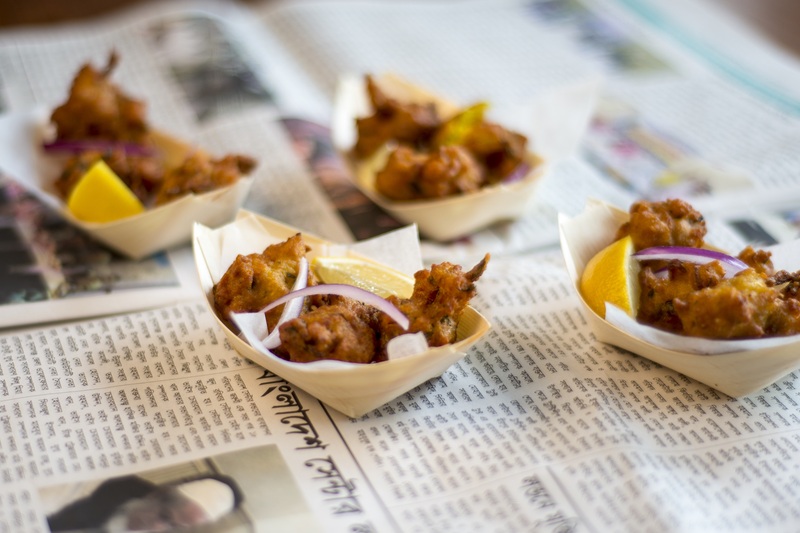 If you’re around Brick Lane during Ramadhan you’ll spot some of the Bangladeshi cafés with their shopfront windows opened up so you can look in on large pans of fritters being fried – a real treat to watch. There’s something so comforting about the smell of frying onions and spices that I’m always hard pressed to avoid buying a brown paper bag full of dhaler bora and tucking into them straight away. Drain the lentils and coarsely grind them with the green chillies using a hand blender or food processor. Put the sliced onion into a bowl along with the salt and mix together thoroughly with your hand. Add the turmeric, cumin, chilli powder, gram flour and coriander and scrape in the ground lentil mix. Switch to a spoon and mix thoroughly to form a batter that is loose enough to drop off a spoon – if the mix is too thick, loosen it with a dash of water. Heat the oil in a wok or frying pan over high heat. Once hot (test with a tiny bit of batter – if it sizzles and floats to the surface, the oil is hot enough), reduce the heat to medium and use your hand to carefully drop small golf ball sized portions into the oil, a dozen or so at a time. You can use a tablespoon instead of your hand if you aren’t feeling confident but you won’t get the distinct rounded shape. Reduce the heat to low and cook for six or seven minutes, turning regularly until the fritters are deep golden all over. Use a slotted spoon to transfer to a dish lined with kitchen paper. Continue cooking in batches until the batter is finished. Serve immediately with some sliced red onions and chopped fresh chillies. Cook’s tip – it’s important to keep an eye on the heat as you cook the dhaler bora. Turn heat up to medium-high as you drop the batter into the pan (the temperature drops once the batter falls in); then, once you have a full batch frying, turn the heat to low. This will help them become fully crispy. 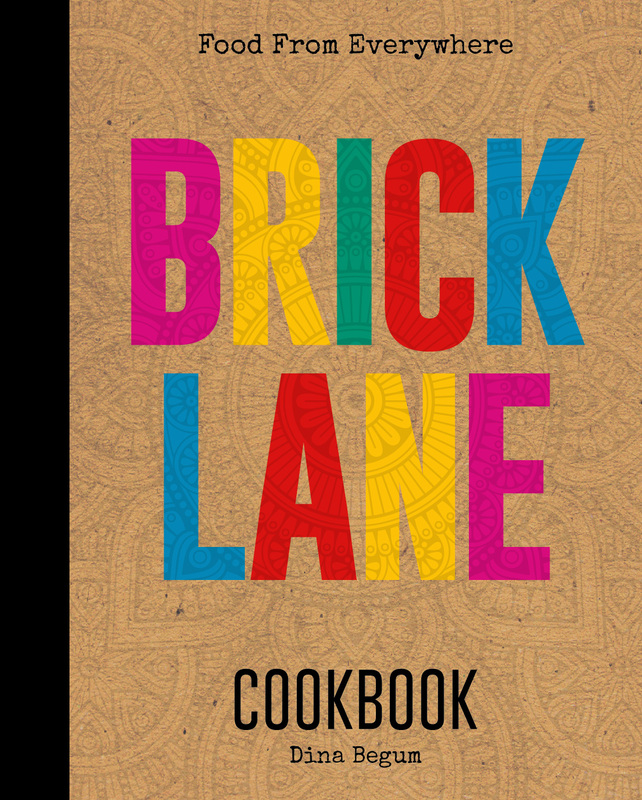 Pre-order Brick Lane Cookbook here.